I was about a quarter of the way through my Saturday morning long run. It was a fairly nice day…overcast and a bit windy, but not too cold for a nice morning run. I was just rounding the corner of Berbergweg (one of my favorite running trails) when I encountered him standing on the path before me. He was tumbling pile of fur, claws, and whiskers. His ears and the sides of his face were black, contrasting the thick white stripe that ran down the middle of his nose and forehead. No, he wasn’t a skunk (thankfully), but he was a large, bristle-furred, sharp-toothed, and somewhat menacing-looking badger. For those of you who know me well, you might recall that one of my favorite book series as a kid was the Redwall books by Brian Jacques. 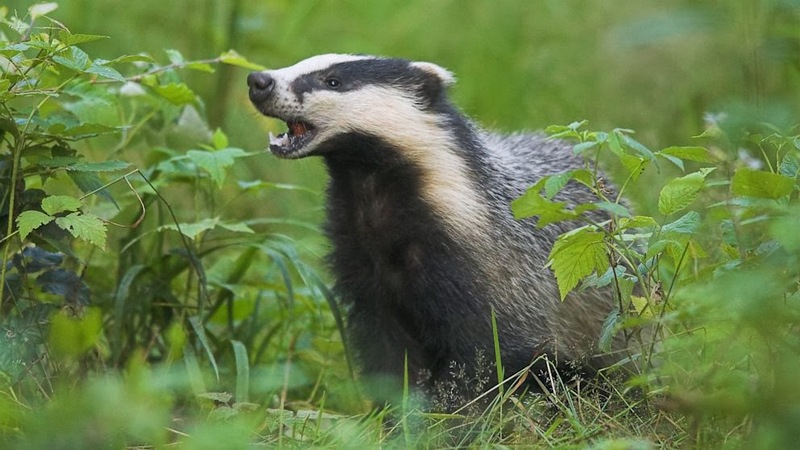 If you’ve ever entered the pages of Redwall then you are most likely aware that the fiercest of all the animal warriors are unmistakably the badgers. According to Jacques, once the badgers are filled with the blood-wrath known only to their species, there is absolutely no chance of escape during battle. And so, there I stood, frozen on the path, staring at the badger, and trying desperately not to replay Redwall battle scenes in my head. I thought that maybe if I could just skirt around to the side perhaps he wouldn’t mind too much if I passed by. I could then continue peacefully with my run. I cautiously took a step forward, but the badger was ready. He arched his back and lifted his two front paws, hissing and snarling like a cat. Okay, now comes the part where I should have probably turned around and made a run for it back up the mountain. But, I was already halfway down the mountain and I had seriously just spent the past 15 minutes running up the mountain. No way did I want to do that hill again. Not to mention the best part of the trail was just beyond his furry body. way to show him how they make me in West Virginia! thanks for sharing! For the next 2 years, I will be serving as a high school English teacher and assistant cross-country coach at the Black Forest Academy in Kandern, Germany. I believe that God has called me to work specifically at this school and I am so excited to be a part of this new adventure. - Praise God for a safe arrival in Kandern! - Please pray as I begin to adjust to a new culture and set up my new apartment and new classroom! -Please continue to pray for the rest of my support to come in soon! I am at 96%, so I am so close to reaching my goal! -Please pray for my future students and athletes. Pray that their hearts will be open and ready to learn and that I will be able to help them grow both academically and spiritually.